Which brings me to today. Everything has come full circle. 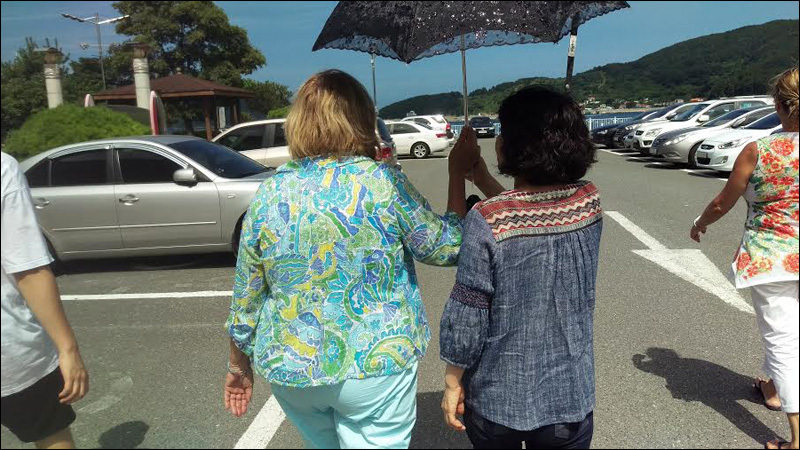 I recently returned from a trip to Korea where my mom (adoptive mother) met my biological mother for the very first time. It was even more emotional than when I had first met them. While they were embracing, I kept thinking about every single moment that had to have happened in our lives for them to finally meet. These two women with incredibly different lives and personalities -- who otherwise wouldn't have any other connection -- now bound together. I could see how much it meant to them to meet one another -- to have a sense of closure on this chapter in their lives. The meeting was short and sweet. It was exactly what it needed to be. The next day we toured the countryside where my biological family grew up on the beautiful island of Geoji-do. They shared umbrellas, laughed about cultural differences, and really seemed to enjoy one another's company. We left a few days later. The following week my moms (plural -- still weird to say) met again in Seoul where we had one more meal together and they got to say goodbye, with hopes to one day meet again. Although communication was always going to be difficult -- I'm happy to say it didn't seem like much of an issue during their brief encounter -- their unspoken bond was loud enough to show their appreciation for one another. Although I'm connected as their son, their feelings of being united are way beyond my level of comprehension. I'm back in the U.S. now and everything is moving quickly back to normal. It's as if I hadn't even left the country. Jetleg is gone and I'm already moving quickly back into work and projects. One day maybe they'll meet again I think. It's because of them that I exist. Full circle indeed. Dan is an alternative rap artist and content producer from Los Angeles, CA. He's also a Korean adoptee and works within the space to create content that speaks to adoptee issues and identity. He's currently working on a new album and documentary series. For updates please follow @DANakaDAN on instagram or @DANakaDANtv on snapchat.